Pure Illustration represent many talented illustrators and artists, some who have worked with us for many years. It’s always interesting to get a back-story about the artist who creates a licensed piece of artwork so we’ve been chatting with our creative team members to find out more about their work. I spent 6 years at Art College, starting with a foundation course. Here I developed a love for illustration, so was able to join the 2nd year of a BTEC National Diploma Course in Graphic Design and Illustration. This led onto a degree course in Graphic Design and Illustration at the University of Humberside, from which I graduated back in 1995. After graduating, I kind of fell into marketing and product development within the gift industry, which I absolutely loved! I worked for two of the UK’s leading candle / home fragrance manufacturers, designing packaging, researching trends, sourcing raw materials and developing new product ranges. I also managed and attended numerous trade shows, which I found very exciting. I would feel so inspired wondering around the greetings and gift halls, admiring the beautiful illustration on the greetings cards etc. 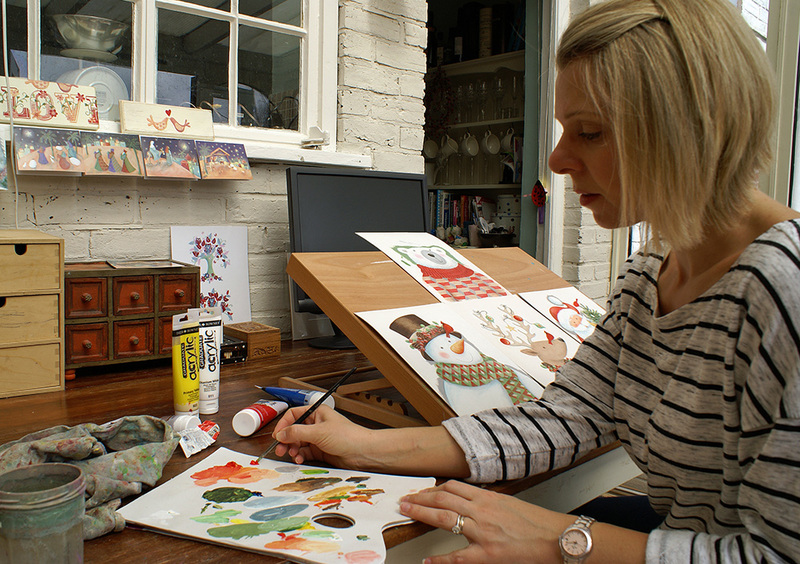 It was when I had my children, I decided it was time to work from home and pursue a career as a freelance illustrator. I started to build on my portfolio, which was very children’s book orientated at the time. I developed a range of illustrated names for children and started selling prints of my work at local art markets and cafés. I set up a website and received commissions from unpublished children’s book authors, and the general public for personalised artwork. All was going well, but I wanted to start working commercially. I took myself off to the Spring Fair at the N.E.C with my portfolio. This is where I met Richard, Krystyna & Kelly from Pure Illustration. They saw the potential in my work, and since then I have been working with them to develop and build up a strong commercial portfolio for licensing. Apart from producing artwork for Pure Illustration, I still love to illustrate for children and continuously develop my range of illustrated children’s names and door plaques. These now sell worldwide via my website and Etsy shop. I also take part in gallery trails and often undertake private commissions. Are there any artists who inspire your work? I love painterly decorative styles with a prominent use of pattern. 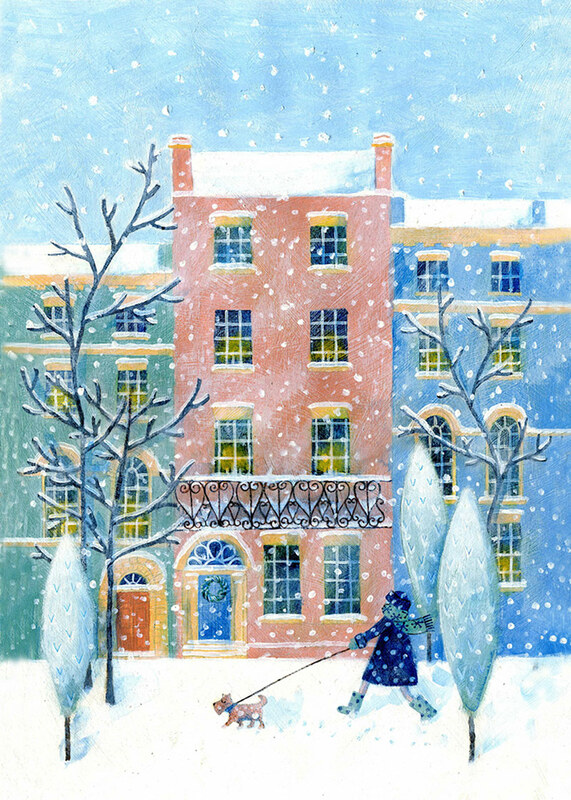 Lucy Grossmith is probably my biggest inspiration. I absolutely adore her work, particularly her beautiful landscapes with floral detail. Also the whimsical work of Jenni Murphy and Julia Crossland. Describe your workspace. Do you have a mascot or favourite pen? 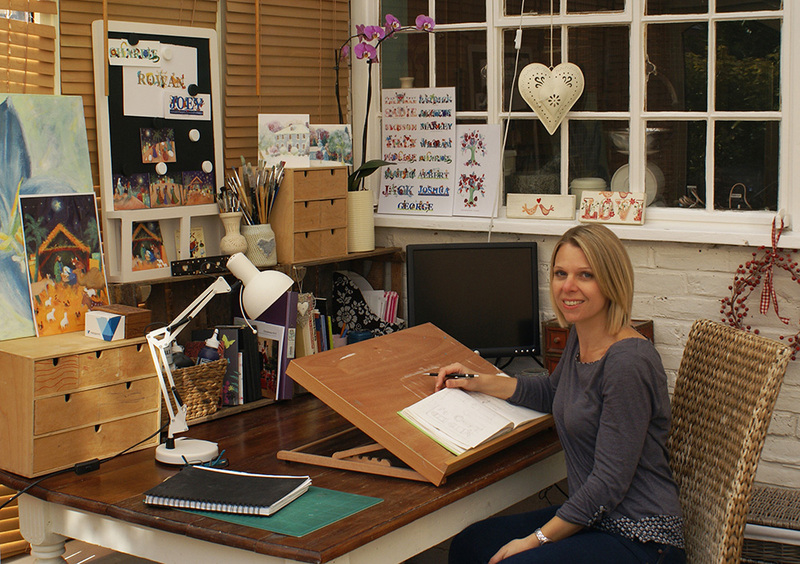 I have a studio at home in the conservatory, which is an ideal work space because of the natural light. It’s so lovely on a sunny day with the doors open, you really feel like you’re working outside in the garden. When I’m sketching and working on rough designs, I love to use a 0.5mm Pentel drafting pencil. I can achieve a lot of detail with this, and it never needs sharpening! I‘ve experimented with many different forms of media over the years, but now prefer to work in acrylics. I love to apply layer upon layer, and use a dry brush technique to achieve texture. I couldn’t be without my extra fine detail 00 paint brushes when it comes to adding pattern and detail to original artwork. Do you have a ritual before you start your creative work? My mornings are usually very hectic, making sure the children are up, fed, dressed and ready for school. Then it’s a mad dash doing the school run, followed by a quick clear up of the house before making myself a nice latte. I then usually put Radio 1 on and get down to creating. What is a typical day like when you are creating? I rarely have a ‘typical day’, which is good. Some days I‘m busy working through a list of illustrated name orders that have come in. All of my characters and letters have been previously painted and scanned. I work in Photoshop to produce the designs, arranging the characters around the letters and playing around with different compositions. I could be working on anything from animals, pirates and dinosaurs to ballet dancers, rugby players and superheroes. I love it because it’s so varied. These then need to be printed, framed and sent out, so I visit my framer usually once a week and make regular visits to my local printer. Other days, I’m working on ideas for Pure Illustration to license for me. 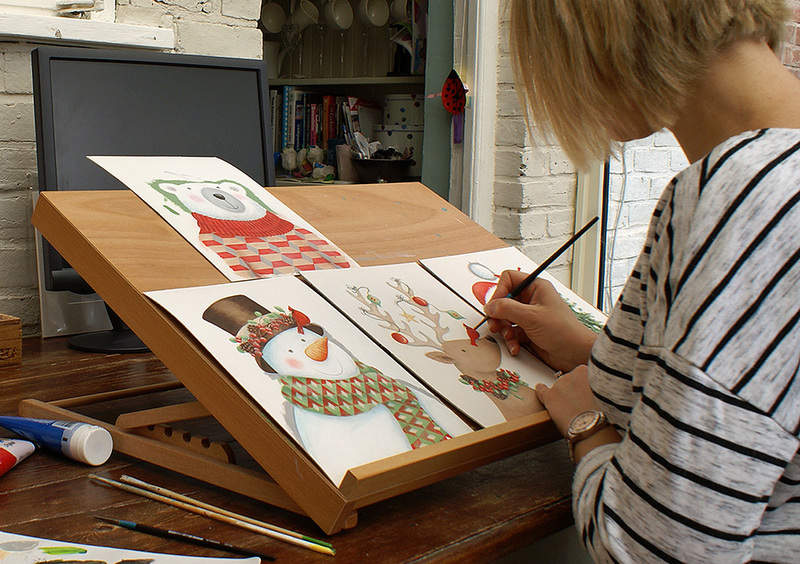 I mainly produce Christmas images and tend to work on a set of four designs at a time. A day is usually spent looking through magazines and the internet, gathering ideas and inspiration. I then work on the rough sketches and composition. When the designs are just right, I paint them up about A4 size in acrylic. I work on all four at the same time, this way I don’t waste paint and keep the colours the same throughout the set. Once the artwork is finished, another day is spent scanning them in and playing around in Photoshop adding some extra pattern and detail. This is the fun bit! I love to experiment with different layers and to see the images develop with the finishing touches. What has been the proudest moment in your art career? I was absolutely over the moon when one of my Christmas images was published by WHSmith. This was the first time I’d seen any of my work in a major UK high street store. It was so exciting when I walked into the store. I’d expected to have to search high and low for it, but there is was clearly visible on the fixture. 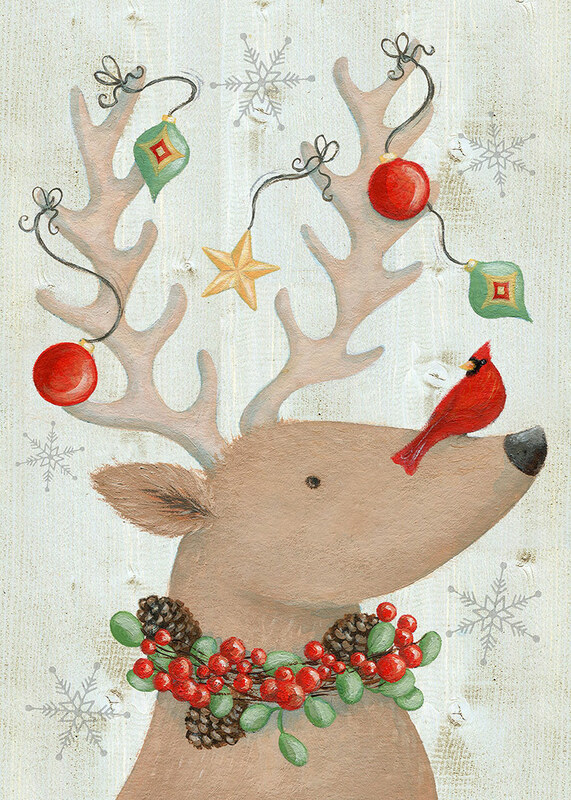 It ended up being the number one selling greeting card in 2013, so a great achievement! Who would be your dream customer to see your work in? I would love to see more of my work on the UK high street. There is nothing like walking into a store over here and seeing your work on their products! My dream customer would be someone like Next, Paperchase or a major department store such as Debenhams and John Lewis. I’m sure my artwork has been in these shops but I’ve not been lucky enough to see it there yet. I plan to produce more everyday images in my licensing portfolio. 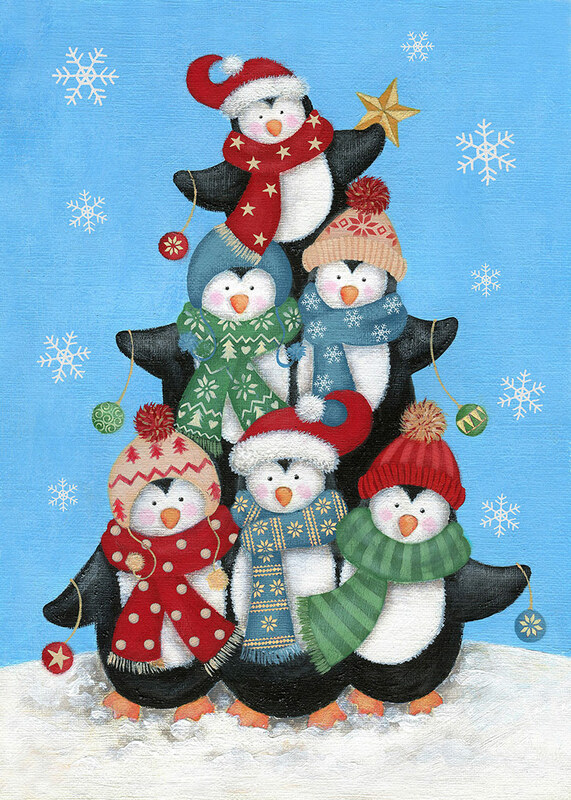 I love working on Christmas, but it would be good to have more variety of work. I love floral surface pattern, so this is an area that I would love to move into in the future. It would be fantastic to get involved in some editorial work for magazines, and book illustration has always been an ambition too.